Our new IntelliCut Expert CNC Plasma Tables provide the highest plasma cutting performance available, combined with superior quality. X-definition cutting ability offered at the best price in the Country!. Power and intelligent control delivers the ultimate plasma cutting systems. Our flagship range of new CNC plasma cutting tables redefines what plasma cutters are capable of. 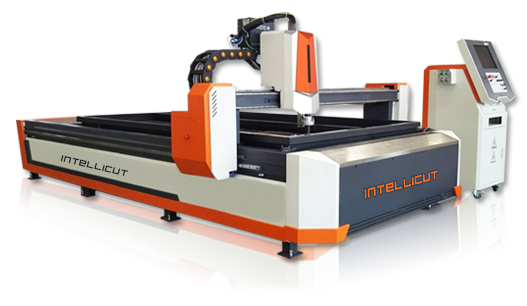 IntelliCut Expert Series CNC plasma tables utilise Hypertherm's state of the art 'X definition' power sources such as the XPR 300, combined with bevel head, multi-gas, vented water injection cutting processes, Hypertherm controls and software. Cut quality is hugely improved, consumable life vastly lengthened and cut speeds and thicknesses are increased whilst driving down operating costs. Experience the next level of plasma cutting, today with an IntelliCut Expert CNC Plasma Table! Plasma Bed: Waterbed for minimal smoke pollution and heat deformation. THC: Arc Voltage Torch Height Control with electronic plate sensing. Safety: E-Stop, obstacle detection, Magnetic torch break away with safety cut-off feature, X & Y limit Switches. Controls: Mach3 Controller – Mounted on Gantry / Hypertherm MicroEdgePro - Fixed. Drive System: Direct Drive reduction planetary Gearbox. Motion System: Pressure loaded Rack & Pinion. Dual X Drive Gantry System. Plasma System Capacity: Full range plasma units (See plasma system section). Up to 3000mm wide by any given length. Rigid, Lightweight Aluminium profile Gantry – optimizes cutting speeds. Rapid Cutting Speeds - 30 000mm/min.